By now you could read articles about various alternative means of transportation such as hitchhiking (even from a female perspective), cycling, and boat-hitchhiking, and now it’s time for something simplest – traveling on foot. 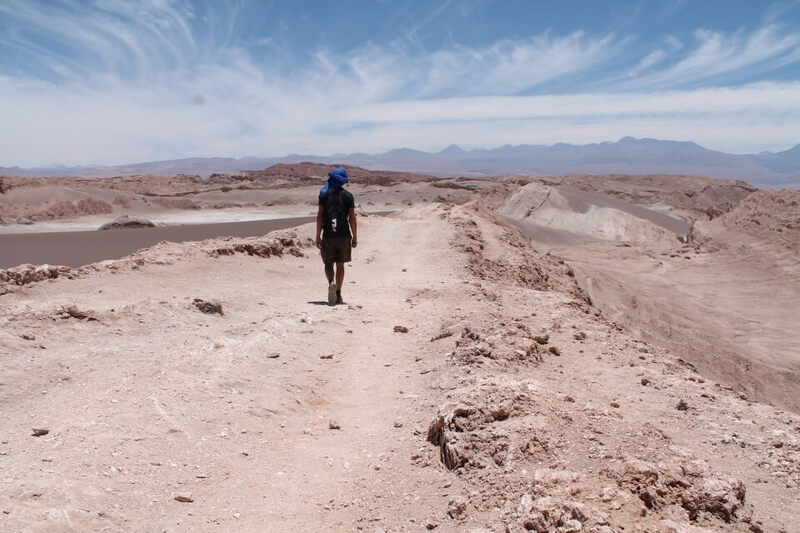 As I traveled on foot just when I was looking for a place to start hitchhiking, I asked an experienced walker, my friend Goran, to share with us his experiences, which he gathered while traveling over 2,000 kilometres, relying solely on his feet. Among all the ways in which one can move around and discover the world, walking as a way of travel still raises suspicion in most people. Two or three generations of automated vehicles were enough to make our understanding of movement without a car, train or plane – unthinkable. The modernization of society, bustling lifestyle and technology development determined the speed of our lives to such an extent that living without means of transport seems impossible. The journey on foot offers a choice to taste and dive into the enjoyment of the whole experience of moving from one point to another, unlike other common forms of travel that offer only pleasure coming from one point and going to another. Nimble driver is the one who knows how to predict events that occur on the road. A large stone jutting, cliff on a curvy road, fallen branches from the nearby woods awake a sense of caution. He has to be careful and develop a sense of distance of his vehicle from the reality in which it moves. Unlike a driver who during the journey has to take care not to collide with the surrounding environment, walker can slowly discover the same environment. He slowly approaches the jutting rock, watches it and thinks about how it came there. Walker enjoys a view of the winding road and easily avoids the fallen branches because he has time to notice and feel the space between himself and obstacles. It has long been normal to go hiking for several days. Then it became fashionable notion of “trekking” which moved walking out of the mountains and introduced it in many other areas and thus walking evolved as a way of travel. By itself, the journey on foot is no art. Everyone can walk, its enough to open the door of the house and leave. However, to do it in a good and a safe way it is important to determine the purpose of the trip, to ensure that we will bring everything we need and possibly consider where we will sleep during every night. The body is our most important ally in this endeavor. If we don’t look after it, force him carelessly or neglect its signs, in a few days it can turn into our greatest torment and reason for the cancellation. So it would be desirable to practice and strengthen it before traveling. A little running during the week, weekend hiking and exercise before going to sleep – all that should be enough for most of the people to achieve some kind of preparation for traveling on foot. How far should we walk on a daily basis depends on our individual decision. Everything depends on our desire, order and time that you have available. Natural speed of walking is five to six kilometres per hour. However, because of the weight you carry, as well as fatigue, it falls on three km/h. So it would be best that you start with 20 to 25 kilometres a day and slowly increase up to 30-35, depending on you own possibilities. I personally believe that the best thing that walking provides – is a sense of freedom. It is hard to expect experiencing such a feeling if our body is tired, sore and shocked by the experience we forced him on. Our mind doesn’t enjoy it. Our joy and enthusiasm are falling and there is a big chance of giving up by the second or the third day. It is therefore necessary to prepare the body before the trip so it is accustomed to the daily efforts, and train the mind to accept the same. One of the most important things about traveling on foot is to wisely prepare your backpack. What we need depends on our needs, habits and preferences. The amount and range of things that will be found in our backpack depends also on the geographical area in which we walk and what the area offers. Are there shelters and villages on our way where we can spend the night? What we eat and how we cook food? Seasons and climatic conditions of the area are going through a great influence on compiling a list of the things you need. Perfect prepared backpack is difficult to achieve at first and it takes a few trips to figure out what we need. Take into account the fact that we have to carry every gram that we put in a backpack. And our shoulders feel very differently if we pack a little lighter. Perfect backpack volume should be 45-60 litres. My backpack while traveling with all necessities mainly weighs 12 kilograms. It contains: a sleeping bag whose weight depends on the season; gas stove, Swiss Army knife, cups, spoons and forks, pot, small frying pan (which by the way I use as a plate and a cover); two pairs of trousers, one in which I walk, and the other one to sleep and for the time after walking, two or three thin T-shirts (preferably fast-drying) in which I walk and sleep; three pairs of socks, one for sleeping if it’s cold and two that I wear and wash alternately (always buy quality socks without seams); one warm shirt, jacket if its winter. Make sure you have a raincoat that is transferred over the backpack. Since we have to keep our backpacks dry during the rain, it would be good to have a cover for a backpack that gives additional protection. If you are on the road that does not offer accommodation, tent and sleeping pad belong to the mandatory equipment. Several meters of rope that we use for drying clothes after washing. 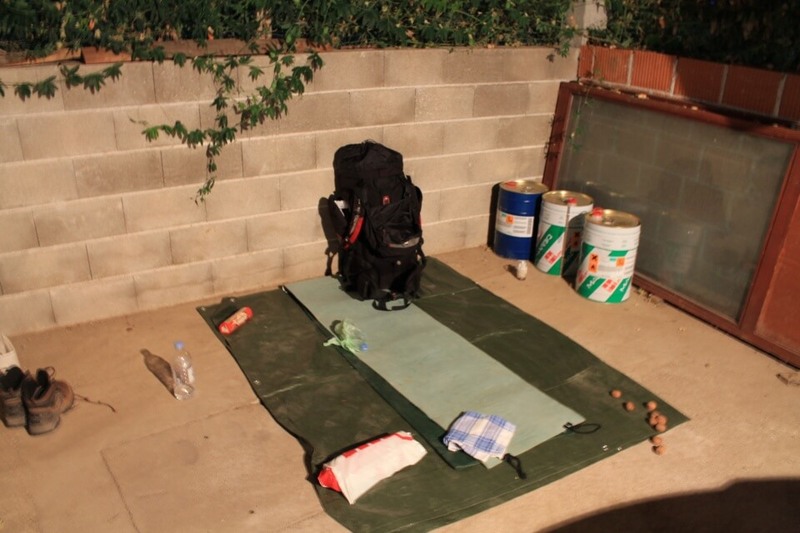 There are also two small quick-drying towels and toiletries, toilet paper and headlamp. Aluminum foil pouch and first aid in case of need – it can save your life. Since the preparation of backpacks varies from individual to individual, some carry a laptop, camera, journal, a blanket, walking sticks, candles, books, GPS, MP3, an instrument, etc. While traveling like this, sleeping besides the road is inevitable. The existence of safe shelters and accommodation makes it easier. As we walk, two things may create additional burden – the question “I’m on the right track” and “where will I sleep tonight”. 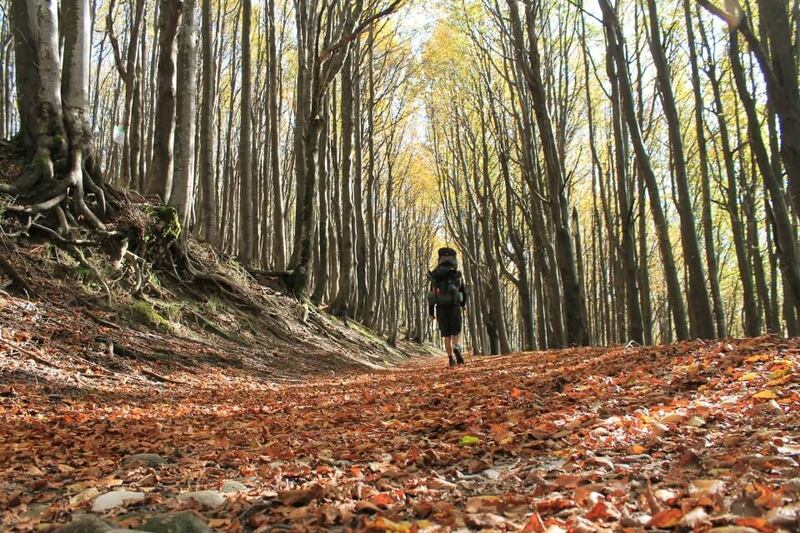 If we walk Spanish Camino de Santiago, its not likely to have any of those doubts. The walker is in great marked route which offers accommodation at the end of each section. Walking in such a way offers the possibility of complete merging with walking and with yourself. But, simple desire to walk and connect two points on the map provides different travel experience. You design the routes to figure out where to spend the night on the road and how to organize food and water. Passing through uninhabited area includes sleeping in a tent and experiencing the dark and the wild. 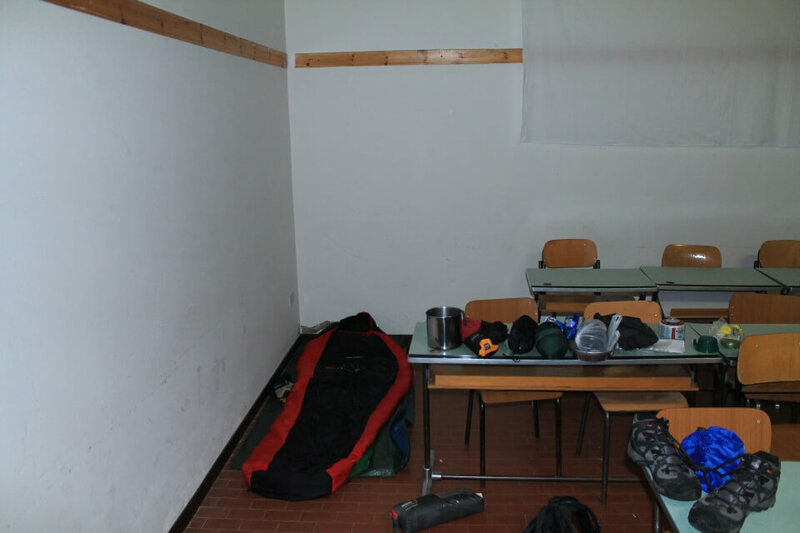 During passages through villages you can pitch your tent in a field or ask someone to allow you to sleep in a garage, barn or under the balcony. It’s up to us what experience we’re looking for from walking. Sarah Marquis, who spent three years walking from Siberia to Australia, felt that the biggest danger is coming from people. Therefore, she fully focused her journey into the wilderness and avoiding contact with locals. In my opinion, the beauty of traveling on foot is that it offers the possibility of making contact with people living in the area through which we walk, so I use sleeping as the possibility of exercising that contact. 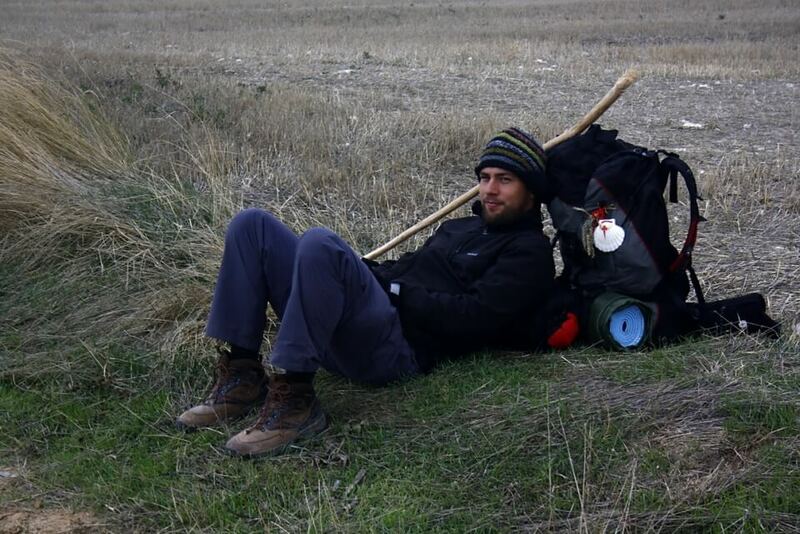 During a walk through Istria in 2011 I followed a marked hiking trail and walked ten days without a tent. I asked the local people for accommodation and thus achieved incredible contacts and knowledge of the area through which I passed. Through this experience I realized that walking offers a different dimension of approaching people. Our natural speed and a backpack on our backs do not cause fear, but curiosity that can be used to obtain a modest shelter. Body aches, blisters and fatigue are common companions for walkers. If our physical condition is not good, it is expected that during the journey we get minor injuries and that pain will follow us for a while. Pain in the knees, hips, tendons and shoulders are common occurrences. So it would be advisable to travel relaxed and slowly for the first few days. This allows your body to adjust. Fear of pain due to poor physical fitness should by no means hinder the desire to travel on foot. While walking Camino de Santiago I had the pain in my knee and tendon. At first, I was angry because I couldn’t follow my travel mate, until I realized that this pain was a great excuse to walk slowly and stop when I want. Pain slowed my movements and warned me of undue haste as a result of our daily lives. Blisters cause majority of problems for walkers. Some regard them as medals for distance traveled, but for me they are my fiercest enemy. The only help with avoiding blisters is prevention, and this will be achieved if our shoes are comfortable, as well as the purchase of high quality socks. It would be good to acquire the habit of removing shoes during the breaks to give your foot some time to dry out, or to change sweaty socks during walking. If you do get a blister, the best would be to puncture it with a needle with a string. The string is left in the blisters and the knot is tied, which enables the creation of hole that does not close, and through which the blister empties and dries out over several days. It is very likely that blisters appear in the same place during each walk. Then it would be a good to put a plaster to protect the area during the entire trip. Like with traveling in general, walking alone or with someone are two completely different experiences. If we walk with someone, we have to think how well do we know this person. Few days of traveling with someone sometimes feels like couple of years of coexistence. Disagreement with your fellow traveler during walking can greatly complicate, if not ruin your journey, as opposed to independent walking in which we are directors of our movement, speed and breaks. Such an experience of walking offers the possibility of getting to know loneliness and ourselves. This of course does not mean that we can not experience the same experience in the company of someone else. After all, alone or with someone, everything depends on us. It all starts with the desire to get to know an area, fantasizing about how to connect two dots on the map, or some cool project. But at the end, our walking gives us the experience of getting to know yourself and your own purpose. While walking, we live in a reality through our senses. The first few days we go through detoxification of the body and mind. Physical pain caused by fatigue is unbearable for our mind which is related to the safety and comfort that we left behind. But after a few days, our body is trained and our mind becomes one with the body and the moment that surrounds it. Over time, we see the beauty of everyday simplicity. We check the time only when starting our day journey and setting the alarm clock before going to sleep. The connection to the land and nature that surrounds us fills us with peace and purpose. Each step marks the convergence of the desired goal. We become aware of the freedom given to us and we are entering a timeless dimension in which we are the main creators of our mood. We get a chance to feel who we actually are and which way to march through life. Common to all the people who have embarked on the journey on foot is that in addition to the external trip through the country and the area through which they pass, they have the opportunity to travel through their own being. We can walk everywhere. Whether we walked for a day or more, chances to return home disappointed by the decision we made is minimal. There are a lot of marked trails passing through beautiful places in the world. In Europe, the most famous pilgrimage route is Camino de Santiago in Spain. The entire Spain is marked with paths that lead to Santiago. The most popular route is the Camino Frances, which begins in the French Pyrenees and ends at the Spanish coast of the Atlantic Ocean. The route is 880 kilometers long and it takes 30 to 35 days to walk. On the way you can find accommodation of different quality and price. Annually Camino counts over 200,000 walkers. There is also medical help for people who walk, and for a few euros you can move your backpack to the next place of accommodation in case of injury or fatigue. In addition to Camino, the more popular becomes the Italian Via Francigena, which is slightly more expensive than Camino. In the world, people often engage in walking in Nepal or Peru, in the direction of Machu Picchu. The most expensive part of traveling on foot is the purchase of clothing and equipment. Cheap and poor quality equipment can certainly affect our enjoyment while traveling. Travel expenses are entirely individual matter. Costs on the Camino de Santiago should not exceed 12 euros per day, which is only possible if you cook your own food and do not spend on unnecessary things. The journey on foot can be very cheap if you are willing to travel completely independently. Sleeping in a tent and cooking for ourselves can be done cheaper than living in your everyday life. So, smile on your face, and hit the road. Bali, and few other stories.